I got thinking about my Grandpa Art today. The picture above is from the celebration of his 45th Wedding Anniversary. He was surrounded by his precious wife Helen, and all seven of his grandsons. He wouldn’t live to see his 50th. Anniversary. I had one Grandpa who was a pastor, and one who was a tool and die worker. Grandpa Art was a tool and die worker, but he taught me as much about Jesus as my Grandpa who was a pastor. Both men, loved the Lord and were a shining example for Him. In many ways, I had an idyllic childhood. No child understands that when they are growing up. Idyllic doesn’t mean perfect, but I had a home that was surrounded with love. My parents celebrated their 50th wedding anniversary almost two years ago. They are very much in love, and never failed to demonstrate that love to my siblings and me. My grandparents on both sides lived near us. They loved their grandchildren, and poured that love into us with their time, their laughter, their gifts, and their stories. 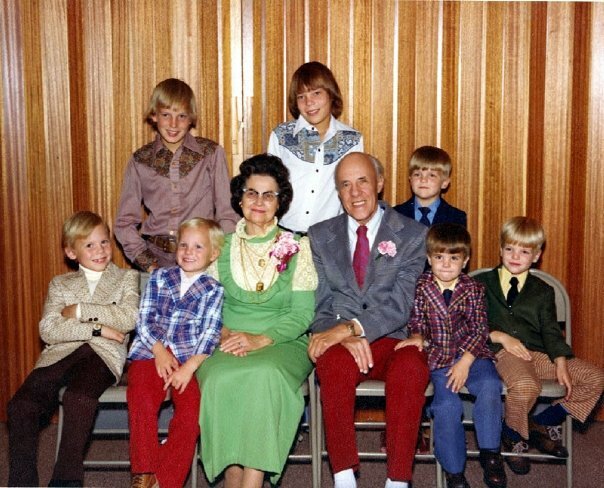 As a child, my brothers and I spent a lot of time with my mother’s parents. Her mom would eventually come to live with us when my Grandpa Art passed away. I was just a young boy when Grandpa died, but somehow I can’t get the memories out of my mind of afternoons spent around his television set watching the Chicago Cubs play baseball on WGN television and then around his chair listening to him tell stories. Some of my fondest childhood memories are of the afternoons spent at Grandma and Grandpa’s house. My Grandpa Art was a tool and dye worker. He didn’t have much of an education. He went to night school to learn how to become a Naprapath, which was a way of helping others deal with pain in their backs. Grandpa loved calling himself a Doctor of Naprapathy. It was something in which he took a lot of pride. I think he loved helping others deal with pain, because he had so much of it in his life. Before my mother was born, my grandparents lost a son. His name was Teddy, and he was just a little boy, so full of life, the apple of his parents’ eyes when he contracted meningitis and died in just a few days time. Our English language has no words for a parent who has lost a child. It’s just too painful. It’s not the natural order of things. When a spouse dies we are a widow or widower. When a parent dies we are an orphan. But, when our children die we just grieve, and grieve and grieve. Teddy was my grandparents’ only child at the time. The Lord would see fit to give my grandparents two little girls in the convening years. He also blessed him with seven grandsons in whom he took great delight, and a granddaughter who was born after he died, and whom he will meet in heaven. In his later years, Grandpa developed severe diabetes. He lost some toes and eventually a leg to the disease. Through all the pain he still had a twinkle in his eyes, and a story on his tongue. I don’t know when my Grandpa Art started writing poetry. It could be that he wrote poetry throughout his entire life. I think Grandpa’s poetry became a sort of therapy for him. Like me, he remembered his childhood as being idyllic. It was a simpler time. He grew up on a farm in Michigan with parents, siblings and grandparents who loved him. This book is a compilation of poems that he wrote, intending to someday publish. I found the poems in a folder while preparing to move my parents out of my boyhood home and into their retirement home. He had put a title on the folder – A Country Life. In the pages that follow, you will see the memories of a boy growing up a farm from around 1909-1929. I hope that Grandpa’s poems will inspire and encourage you. Beyond that, I hope that you’ll take delight in Grandpa’s God. He was above all things a man of faith. He loved Jesus with all of his heart. He loved his wife. He loved his daughters. He loved his sons-in-law. And he loved his grandchildren. It was his faith in Christ that was his compass in the darkest of days, and his hope for eternity. Enjoy . . . A Country Life. Here is one of my favorite poems from this soon to be published book. Let me know what you think. A time that was precious and dear. Would focus the light toward the wall. Was right where that brightness would fall. And there we’d say grace with bowed head. Such interesting games we would play. Each evening so happy, each day. These tasks brought we boys much delight. A neighboring family came o’er. We children played games on the floor. With doughnuts and good things each night. But then, were the best that we had. Made little boys living then, glad. A switch floods the room full of light. When kerosene lamps brought delight.